Twinpanic.com: What Do You Do with All Your Free Time? This post begins a new emphasis for twinpanic.com. Looking at my hit statistics, I see that readership is close to non-existent for my collection of fun facts about twins. (Unless I mention the twins from "Raising Hope" -- oh look, see what I did there?) So from now on, I'm going to make this blog more about personal stories of life with twins. That way, even if I don't expand this blog's reach, I will connect more directly with its readers. One of the running jokes Christina and I have is to ask parents with one child, "What do you do with all your free time?" They always laugh, because compared to being kid-free, having one child seems like a lot of work. Now, Kawasaki disease itself is an excellent reason for panic and will undoubtedly be the topic for future posts. (Spoiler alert: Salem's recovering, and it looks like he'll be fine.) But it also gave me the opportunity to contemplate life with a singleton. The first thing that I noticed is that, yes, it really is a lot easier. When Jack needed my attention, I could give it to him undivided, without having to keep one eye on Salem to make sure he didn't get into bigger trouble. When I undid the baby gate and picked up Jack, I didn't have to figure out how to close it again immediately while keeping a firm hold on a wiggling child. As a bonus, we have twice as much gear as we need. If one high chair was dirty, there was a chance the other one was still clean. Want to take Jack out to the swing set in the back yard? Pick him up and go. No struggling with a double stroller or waiting until a second pair of hands was available. Tuesday morning, I desperately needed to re-stock the groceries (even before the hospitalization, taking care of what had been diagnosed as an ear infection in Salem was chewing up a lot of our spare time). So I put Jack in the car and drove to the store. Take two adults to the grocery store. Find a store with a "two-seater" shopping cart. But not just any "two-seater" -- Christina is now aware of the subtle differences in shopping cart models between ones that will hold two toddlers and ones that are only suitable for older children. I don't know, maybe you have twins you can put in a carrier without inhibiting your ability to shop. Ours are too squirmy to do so. 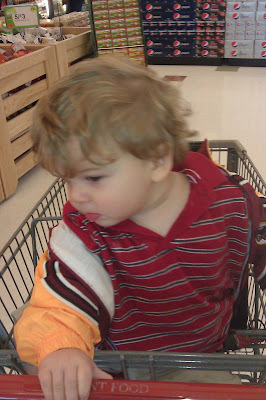 It was also easier to move about this store without shoppers gawking at the twins. Jack did receive some attention -- he is a cutie, after all -- but not nearly the level (or even half that) he would have gotten accompanied by his brother. So other than grocery shopping, what did I do with my free time? Laundry. Lots of it. Along with moving, the change in seasons and other factors caused clothes to pile up in diverse locations of the house. I finally had time to sort through it and do most of it. I even got to wash the kimono I had picked up in Japan in December 2009. When I bought the kimono, I thought of it as good "dad" clothing -- something only mildly embarrassing to your kid if you tromp around in it in the morning. I bought it in the handful of days between finding out that we were going to have a kid and finding out that we were going to have two, so it seemed appropriate to wear while taking care of Jack. Salem's been home almost a week now, and the experience of taking care of one kid at a time is being replaced by, "Why are you taking your brother's food? It's exactly the same as the food in front of you." And the laundry is piling up again. Thank goodness. 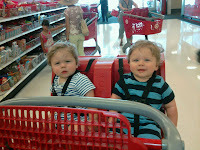 Paul and I frquently take the kids to target (one double stroller and one regular) and then we realize we have no way to push a cart. But like you, I wouldn't have it any other way. 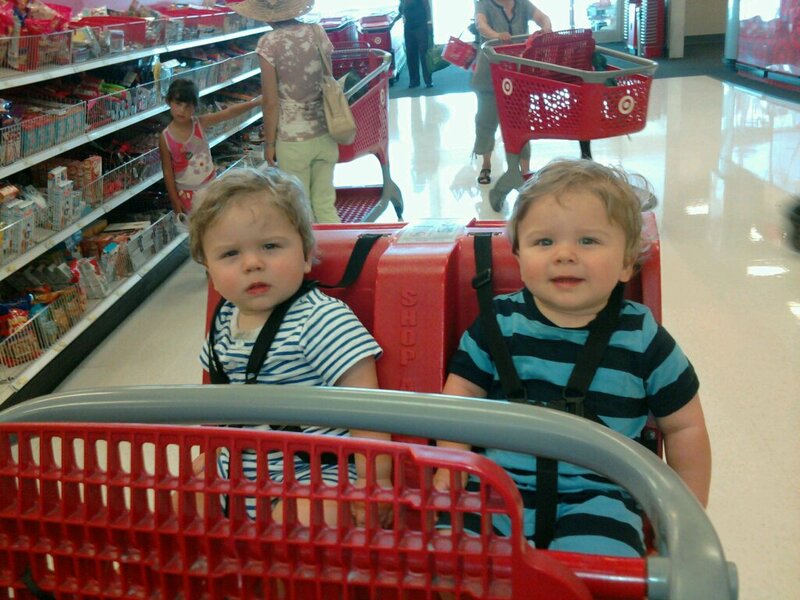 If there are two of you, can't you just put William in the cart? Wow. I'm sorry to learn about Salem's health, but of course glad to hear he's on the mend!!! For the record, I hate going to the store with 3 kids. Two is fine for me. 3 is too much. However, Andrew (although he despises grocery shopping) and I are so in tune that he's super helpful without even having to get direction from me. And laundry is my nemesis. It is never caught up here.